Mortlake, a rural town, is at the junction of the Hamilton and Hopkins Highways in western Victoria. It is 48 km north-east of Warrnambool. Mortlake is overlooked by Mount Shadwell (292m), about 2 km northwards. The Mount Shadwell pastoral run was taken up in 1839 and its proprietor, Captain James Webster, built a homestead near two lakes below the mount. The homestead and the lakes (drained in 1921) were the genesis of the township of Mount Shadwell which was surveyed in 1853. During the next few years the name of the parish, Mortlake, was substituted for the town’s survey name. The inspiration for the name was probably Mortlake in Surrey, England. The slopes of Mount Shadwell were particularly fertile for crops and several farmers settled there in the mid-1850s. The Mount Shadwell hotel was opened in 1855 and a flour mill was built in 1856 (the bluestone chimney and ruins are on the Australian and Victorian historic buildings registers). A school was opened in 1858, a second hotel in 1859 and several stores and a blacksmith by the end of the decade. 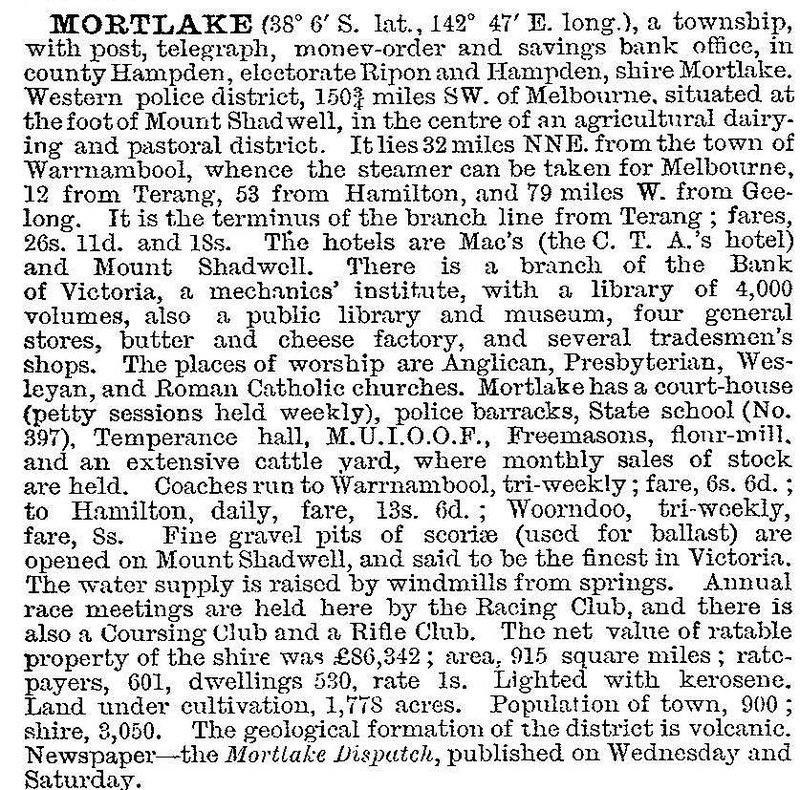 The Mortlake road district was created in 1860 and Mortlake shire was proclaimed on 25 January 1864. Its first office was a disused Presbyterian church building that had been constructed in 1857 which had become too small for the growing congregation. The Presbyterian congregation was the largest, but Anglican (1865), Catholic (1861) and Methodist churches were opened. A temperance hall was opened in 1873. The postwar years of buoyant wool prices kept Mortlake prosperous, but the decline in prices since the 1970s brought about a population decline of about 25% in both the town and the shire. Consequently the township has not been put at risk by redevelopment, and several buildings of the 1860s and 1870s constitute the Shaw Street precinct which has been classified by the National Trust. The precinct includes three churches, among them the heritage listed Methodist church (1867) which has been taken over by a Lutheran congregation, the post office (1864) and the court house (1884). The former Mortlake shire offices and botanic garden (1877) are nearby. (The original shire office is near the Presbyterian church.) There is also a heritage listed flour mill (1856) in Mill Street. Mount Shadwell is about 1.5 km north of the town. It is a scoria cone, from which were ejected egg-shaped molten material which has formed olivine. When broken open, olivine can reveal coloured crystals. Olivine is sought by gem-fossickers, and can be found at the municipal scoria quarry on Mount Shadwell. Mortlake has two hotels, a caravan park, a P-12 school (incorporating the high school opened in 1959), a Catholic primary school (1951), golf, swimming, tennis, bowling and indoor sports facilities, a public hall and a shopping centre. The P-12 school had 254 pupils in 2014. To the east of the town along the Hamilton Highway there is one of Victoria’s best avenues of honour, for both world wars. The Mortlake racecourse has two meetings a year. The closure of the pie factory in 2007 was a serious loss, but the announcement of an electricity power-generation station provoked some economic buoyancy. Supplied by natural gas piped from Port Campbell in a dedicated 83 km gas pipeline completed in 2010, the station was completed in 2012 and is the largest gas-fired power station in the state. In 1994 farming and grazing occupied 88% of the shire’s area. There were 896,000 sheep and lambs, 46,200 meat cattle and 20,650 dairy cattle. Barley, wheat and potatoes were also grown. 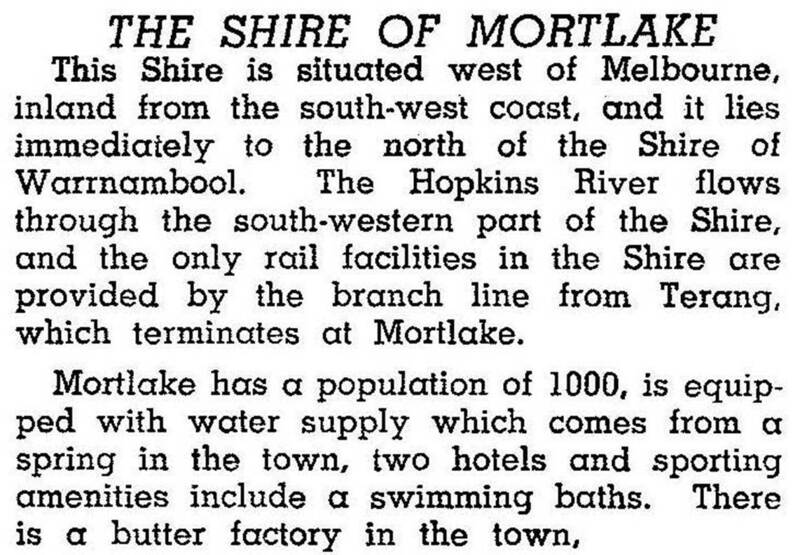 On 23 September 1994, Mortlake shire was united with Belfast, Minhamite and Warrnambool shires, small parts of Dundas and Mount Rouse shires, and Port Fairy borough to form Moyne shire.